no no no you are probably very wrong, the red lines on europa and other bodies probably isnt a bacteria! the radiation on the surface is huge and any type of organic life would not survive there. this lines are probably some kind of salt that was radiation-bombarded for many years. this salt could arrive to the surface from the subsurface satly ocean. True. It is still a candidate for life. I am 50% sure there is something in that sea. Maybe! It's hard to tell because we have no data yet. A solid hydrogen-helium alloy would be cool! Lol, we do have data from previous missions. Composition of Jupiter's interior is determined by models of planetary density as a function of radius, which must fit with observed gravitational field. These show the core is about the size of Earth and is a combination of rocky and metal material. that big antena covered by metal for protection of juno...looks exactly like a probe ready to be launched like it was on cassini and galileo. But this life could be completely different compared to ours. I believe that life can exist at any place if it starts to exist at the right time. But then again, you could be right. If life originated underneath the ice, the bacteria would not be used to the radiation. Unless the life is ancient, and has been exposed for 100,000's years. But the speed of their evolution could be different too, Or maybe evolution doesn't even exist on Europa. What if evolution is a concept that exists only on Earth? Wwadlol, true, i am like you believe that there could be lot of different types of life out there. but in europa case, its probably a life under the ice that protect them from the radiation. and if its organic life like us, i think they may not survive on the surface and without any atmosphere. but there is that water bears here on earth that can survive extreme conditions... so who know? What if it adapted? The Earthcentric view is one view, if you look at things from other views, more possibilities, and thus it may be life but the only way to tell is to send a probe to the cracks to analyze the cracks. Earthcentric view means narrow minded. Maybe the red streaks are dead bacteria, ones that were in the water when it cracked open and poured out and died afterward, maybe the water is red somehow? Ammonia? 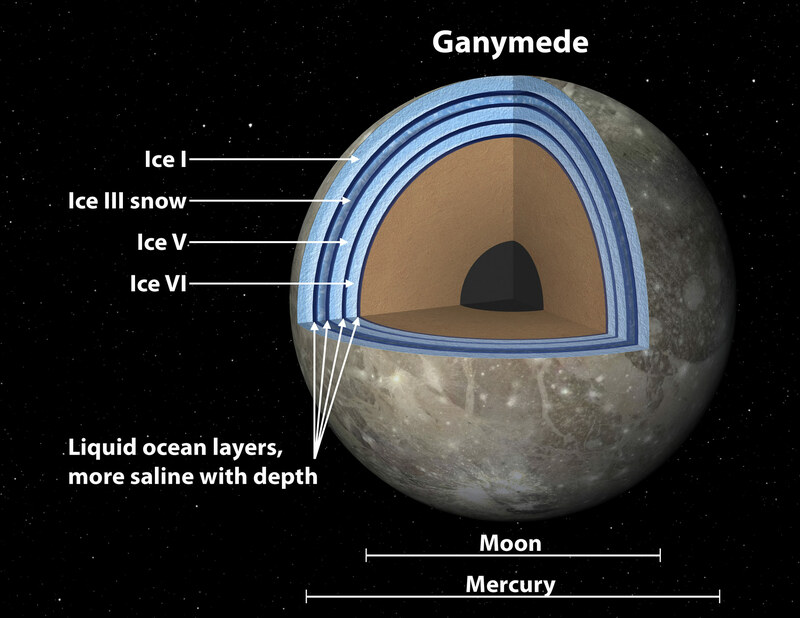 Ganymede may have multiple oceans. What if it adapted? The Earthcentric view is one view, if you look at things from other views, more possibilities, and thus it may be life but the only way to tell is to send a probe to the cracks to analyze the cracks. Planetary scientists are way ahead of you. Watsisname, so radiation bombarded is what turned the salts to red color i guess. This is an excellent free visualization program for following along with Juno in real time as it enters into orbit. Burn complete! JUNO is now in its intended orbit! mmm i see they all cheering right now like we know its successful. but dont we need to wait 40 minutes until we know its succeed? its seems that callisto is dimmer than the other galilean moons. spacer, That's cool! Maybe it's covered in some sort of dust other than snow? Mission control operates according to the arrival of signals from Juno at Earth, not what Juno is doing "right now". So when they were cheering, it's because they just received the tone signaling "burn completed" as planned. Of course, due to the time delay, the burn had already completed 48 minutes earlier.